A handful of ways to keep the blood flowing during those long days sitting at your desk. Office jobs can be divided into two categories: The field job and the desk job. The majority of the working people fall under the category of a desk job. On average, people are spending more than 8 hours a day at their office desk. There’s barely any physical activity involved in desk jobs. Various studies have proven continuous sitting causes lots of harm to our bodies. Besides gaining weight, people are complaining about back related problems and loss of bone and muscle strength. Regular exercise is enormously valuable to keep the body and mind healthy and fit. People understand this but are too busy to take out some time for their own body. However, where there’s a well, there’s a way! Going to the gym is not compulsory. One can perform diverse types of workouts while sitting at their office desk using their very own office chair. The simple looking desk chair is no different than any piece of gym equipment. Some workouts can easily be performed while sitting on an office chair. These include stretching, strength exercise, etc. While these exercises won’t get you ripped as if you were going to the gym, they can help to offset some of the damage done by long sitting sessions at the desk. This is the most simple, easiest and fun way of doing exercise in the office. As the name suggests, it is all about dancing while sitting on the chair. This not only helps in releasing mental stress but act as an energy booster. However, it is always advisable to check the surroundings first and confirm that no one is watching those dancing moves. Sitting does not involve any hard work. Hence, energy usage is minimal. Continuous sitting for long durations results in various health problems like obesity, diabetes, etc. Moreover, it also enhances the risk of heart diseases. Health experts repeatedly advise an individual should take a break after every 30 minutes of the continuous sitting. This means that after 30 minutes, one should stand up and roam around for a few minutes. Standing not only result in the burning of more body energy but also help in stretching leg and back muscles which may become stiff because of continuous sitting. There are many desk exercises which can be done under the table, and no one else would come to know about it. The silent seat squeeze is one of them. It’s an excellent exercise for the legs and buttocks. In exercise involves squeezing of the buttocks and holding it for a few seconds (10-30 seconds). This cycle needs to repeat a few times until the glutes get tired. This same exercise of squeezing, releasing and repeating can be done with abs also. Another thing that could be done using your best office chair is improving the body posture by sitting in the right position while keeping the back straight. 1. Stand straight keeping feet together. 2. Bend the knees, keeping thighs parallel to the ground. The posture should be similar to that while sitting on a chair. 3. Placing knees together, raise the arms up and hold the position for a few seconds (10-15 seconds). 4. Release and repeat the steps. It’s an exercise which helps in generating positive energy in the body. In this, an individual has to bring both the palms together and bring them closer to the chest, the same as praying. Take a deep breath and hold the position for 15-20 seconds. Repeat it as many times as possible and let the positive energy flow throughout the body. Consider making your desk a feng shui model to help keep your mind clear and focused. This can easily be done while sitting on the chair. For this, an individual just has to raise the shoulders towards the ears and hold it for some time – 15-20 seconds is best. It’s a very good exercise for shoulder muscles. 1. Clasp both the hands together (same as a handshake). 2. Pull while trying to resist the movement of the arms. 3. Hold for 10 seconds. There are many different exercises which an individual can easily do at the workplace while sitting in their office chair. It will not only help in keeping the body fit but will also help in releasing mental pressure. An individual with a free and relaxed mind tends to give higher productivity as compared to those working under stress. My name is Lacey and I've always been interested in the health and fitness sector for as long as I can remember. 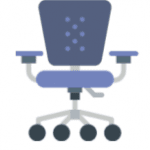 I write for BestOfficeChair, a website dedicated to educating people about the importance of ergonomics and creating a healthier lifestyle in an office setting. I'm constantly looking for new ways to optimize my performance, and hopefully, I can share those experiences with our readers.